Tag Archives for " Talking Shrimp "
There are at least 2193 ways to make your content better and the best copywriters know them all. However, there are just three things that every marketer must master to dramatically improve their copy. Your web pages, brochures, and emails must have Clarity, Personality, and Resonance (CPR). Review every word you write for CPR and you are on the road to success. 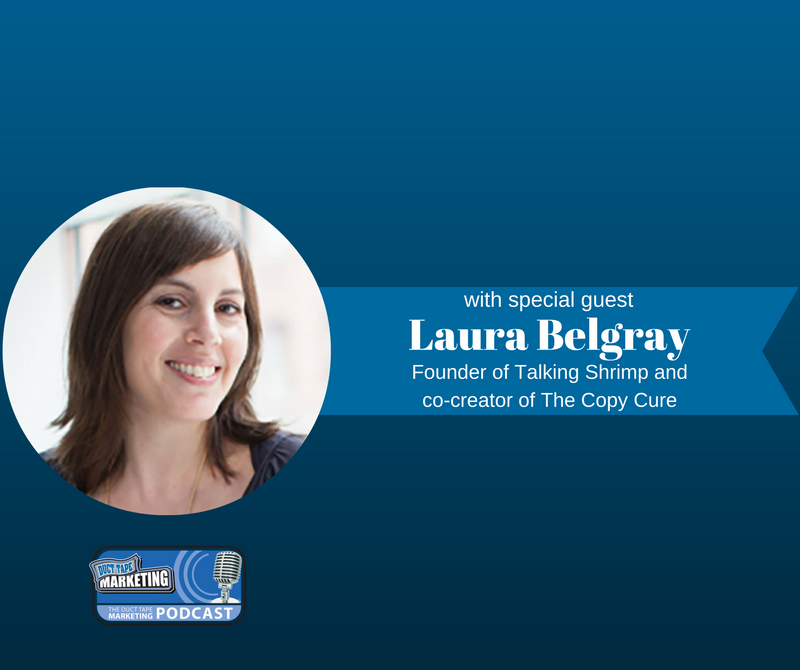 My guest for this week’s episode of the Duct Tape Marketing Podcast is Laura Belgray, founder of Talking Shrimp and co-creator of The Copy Cure. Laura and I discuss content and what it takes to create copy that is fresh, vibrant and drives sales. Having been a professional writer for nearly two decades and earning a number of honors and awards, Laura knows all about producing killer content. Laura has written for SPY Magazine and New York Magazine, as well as a variety of television stations including Bravo, NBC, HBO, Nickelodeon, VH1, the CW and USA – to name a few. If you’re writing creative and exciting copy that is supposed to drive a decision but your client tells you that what they do is really boring, how do you make it spicy? What place does humor have when creating copy? When you sit down to write a sales letter, hoping to touch a range of emotions, is there a set of standards that you use to create the content? Learn more about Laura Belgray and her company, Talking Shrimp here. Partnered with Maria Forleo, Laura is also co-creator of The Copy Cure, an all-in-one program to help you find your voice and sell your anything. To discover more about this amazingly informative 5-hour downloadable program, click here. This week’s episode of the Duct Tape Marketing podcast is brought to you by magicJack for BUSINESS. If you own a small business, you know that the phone is your life line. magicJack for BUSINESS will give you phone reliability for a lot less money. Sign up at magicjackforbusiness.com/ducttape and receive two months of free service and the first few to sign up will receive a free phone too!